A look at the new "Search Appearance Overview" pop-up window that appears in the updated Webmaster Tools UI. I didn't catch this until recently, but Google has added a nifty little tool to help explain search results elements, and how we can influence the data they contain. When you hover over and click specific elements, a bubble will reveal helper text along with clickable links over to Google's Webmaster Tools help screens. Write informative, relevant descriptions in the HTML title tag for each webpage. In Webmaster Tools use the HTML Improvements feature to help optimize the title tags on your site. Provide an accurate, succinct summary of the page’s content in its meta description tag. Write informative and relevant content for the page's body. Use the Webmaster Tools HTML Improvements feature to help optimize the meta descriptions on your site. Sitelinks are generated algorithmically depending on the website and the user query. You can’t “activate” sitelinks. If you don't want a page to appear as a sitelink, you can demote it in the Webmaster Tools Sitelinks feature. The search box is triggered algorithmically based on the website and the user query — Google displays it when they think it might help the user refine their search. How to influence - Organize your webpages in a logical structure. You may also want to consider using breadcrumbs. The Webmaster Tools URL parameters feature allows you to give Google information about how to handle URLs containing specific parameters. Mark up the relevant parts of your webpages to help us understand your content. Use Webmaster Tools Data Highlighter to tag your event data. Check the Structured Data dashboard to see if your marked up content has been crawled. Mark up the content in the body of your webpages. Check Webmaster Tools the Site Navigation Element part of the Structured Data dashboard to see if your marked up content has been crawled. 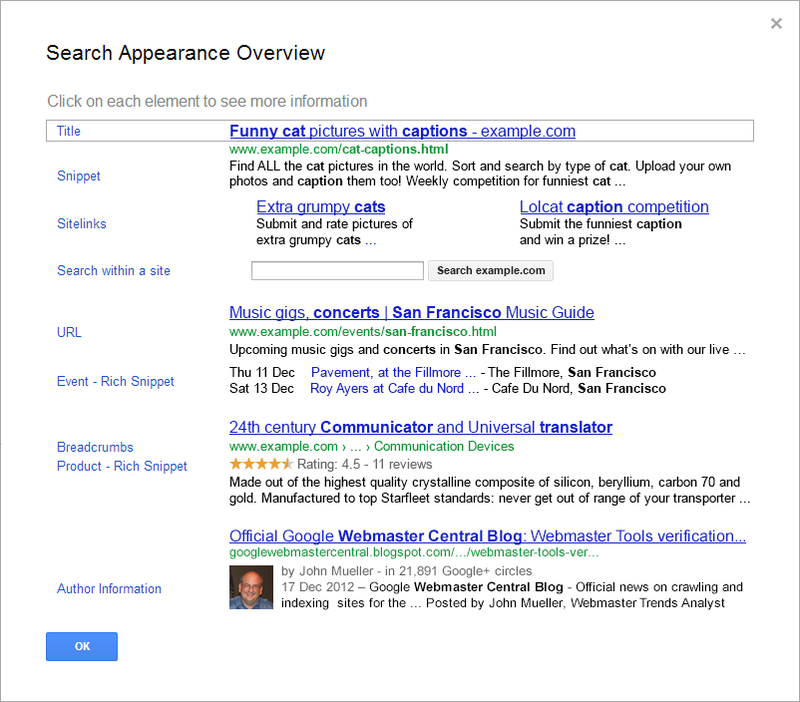 Check Webmaster Tools Structured Data dashboard to see if your marked up content has been crawled. Verify authorship of your content by associating it with your Google+ profile. Check Webmaster Tools Author Stats to see which author profiles are associated with your content. It's a great interactive teaching aid, and hopefully the first of many to come.